The first Christmas after the loss of a little one is painful. 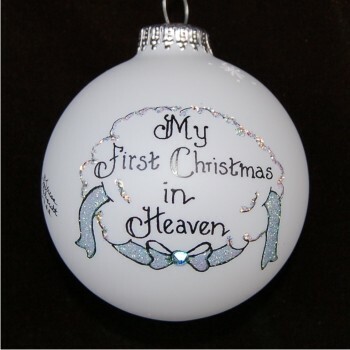 This sensitive memorial first Christmas in heaven personalized ornament brings a note of hope to the season. Parents often choose this ornament to honor their own son, and it's an appropriate gesture for friends who have lost a little fellow in the last year. We'll hand paint your personal message on the opposite side of the memorial for boy: 1st Christmas in heaven personalized Christmas ornamentt. We offer several memorial ornaments personalized by our lettering artists, so you'll find just the right one for your situation. Wonderful reminder Nov 8, 2014 Ellana T.
memorial ornament Nov 6, 2013 Robin B.